While Celtic Connections has more and more an international line-up featuring the greatest (mostly) Celtic talent from all over the world, the festival still represents also the best of Scotland's own musicians. The Gaelic culture is an important part of Scotland, and several concerts presented the best Gaelic talent currently on offer in Scotland. 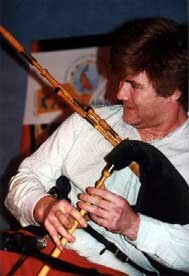 Two of the Scottish highlights of Celtic Connections 1999 were the big showcase concert "Horo Gheallaidh" with Fred Morrison's Ceolas and a bunch of Scottish singers, and the intimate concert of Mackenzie. If you ever thought about what it must be like in heaven, go and hear Mackenzie - these three girls will take you with their lovely singing to other beautiful worlds. The intimate setting of the Piping Centre was just the right setting to experience one of the most beautiful attractions of the Gaelic scene. The Piping Centre featured every evening one of the more traditional Scottish acts, always supported by a "tradition bearer" representing the pure Scottish culture. This evening, the bearer was Gibb Todd, one of the representants of the Scottish folk revival from the 60s. At Celtic Connections he is a most familiar face, being the compere at both Danny Kyle's Open Stage and the Festival Club. Gibb presented this evening a couple of great songs, before he left the stage for the main act of the day: Mackenzie. Mackenzie consists of sisters Fiona, Gillian and Eilidh from the Isle of Lewis. Best known on the international scene is Fiona, who is member of the group Seelyhoo and, since recently, also of Anam. Eilidh was a member of the group Mac-talla. The three pretty girls are seldom seen together on stage, as they have to juggle careers, motherhood and music. Although it might be regretted that Mackenzie can only rarely be seen, still this surely helps the trio to stay very natural in their music. The girls started with a few songs on their own, a capella. All three have beautiful voices, harmonising very well with each other. Their harmony singing in its natural style enchants the listener; the singing is full of passion and soul going directly to the listeners heart. And these are not only gifted singers, but also highly talented songwriters - their own Gaelic songs are written in the traditional ideom, sounding very fresh and beautiful. Highest quality material written by a generation of musicians that will carry 'new' Gaelic traditions into the new millenium. For about half of their set, Mackenzie were joined by Michael Marra (who has also produced their debut album Camhanach) on piano plus musicians on bass and guitar. Although the bass seemed at times too loud for the sweet voices, the singing was still at the forefront of the sound. Mackenzie brought with their enchanting music their audience into seventh heaven. It has been an absolutely stunning show of three highly talented, beautiful young women presenting the beauty of a language and culture that has yet survived but still is in danger of dying out. The day before Mackenzie's show, the Night of the Gaels took place at the Main Auditorium of the Royal Concert Hall. Fred Morrison, the best Gaelic piper around, had assembled for this show a stellar line-up of some of the best Gaelic singers. Another special Celtic Connections evening, featuring the glory and wealth of Gaelic culture. The evening started with a set of Fred Morrison's latest adventure - his very own Gaelic band Ceolas. Fred has assembled the young talent of the scene in this band: Fiddlers Ronan Martin and Ken Fraser, Will Lamb on Bouzouki, Ross Martin on guitar and finally the brill young singer Alasdair Codona. Ceolas are without doubt one of the greatest things that has come out of the Scottish-Gaelic scene since years. They present in their tunes the raw energy of Gaelic jigs, reels and strathspeys. The band's sound is very full and energetic, it's also fun to watch the band. Add to this a superb Gaelic singer with a great soft voice, and you have - Ceolas, a band that plays Gaelic music fit to carry it right into the hearts of a new generation of folk music fans. After Ceolas' own set, the band backed also the other singers of this evening. Margaret Bennett (the mother of Martyn Bennett who - with his band Cuillin Music - has created Celtic Club music) was first invited on stage. The lady from the Isle of Skye represents true and old traditions in a fascinating and fresh way. She is a skilled singer, and knows also to capture her audience with her story telling. Of course tonight the focus was on Margaret's huge repertoire of traditional Gaelic singing, presented in a very honest way. She was joined for another song by the next great Gael, Mairi MacInnes. 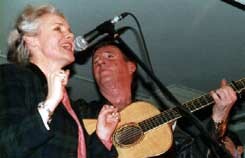 Mairi sang then a few songs on her own, followed by Ishbel MacAskill, a great singer from the Isle of Lewis. At the end of the first half, the four singers gathered on stage to have together another song leading into a powerful tune by Ceolas. Soon Ishbel, Alasdair, Ken and Mairi went to the front of the stage to dance to the tunes, bringing a bit of the informal atmosphere of a traditional house party. The second half started with a set of Capercaillies singer Karen Matheson supported by her husband Donald Shaw on piano and (unfortunately also) keyboards. Afterwards, the show went on as it had ended before the break: Ceolas played tunes, the singers Mairi, Alasdair, Ishbel and Maragaret sang songs - some solo, some in various combinations. Everything had a bit of spantaneous atmosphere, in which the Gaelic culture was celebrated. The last song of the set featured all singers of the evening - inclusive Karen Matheson. Cànan nan Gaidheal, 'The language of the Gaels', the great song celebrating the Gaelic language written by late Gaelic bard Murdo MacFarlane, was a fitting tribute to the culture that was presented this evening. The musicians and singers were called back afterwards for an encore - a song, that lead into a tune with some of the performers once again dancing on stage. Both of these evenings gave a stunning presentation of Gaelic culture and of highest quality Gaelic perfomers. You might conclude that Gaelic culture is very much alive and up and coming these days. But, to conclude this review, Gaelic culture is still on decline, and Gaelic music and song is sometimes less often heard on the Outer Hebrides than on the Scottish mainland. Hopefully the new Scottish parliament can reach anything with their planned initiatives to support Gaelic language and culture. If you like to read more about Gaelic culture and language, and if you like to find out about the relationship between Scots and Irish Gaelic, you can read in this issue also an interview with Mackenzie's Fiona and her Anam collegue Brian O'hEadhra. This is the last of a series of live reviews from Celtic Connections - watch out for the other ones in the last FolkWorld issue!